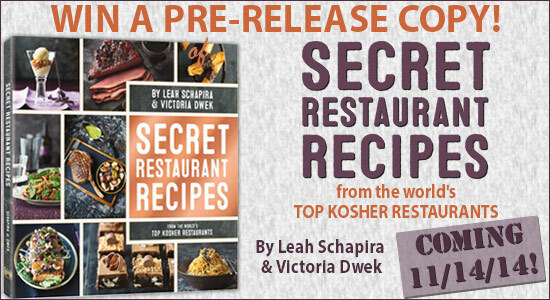 Win a Pre-Release Copy of Secret Restaurant Recipes! The finest restaurants. The most talented chefs. The most delicious food. All in your kitchen. Want to recreate the popular dishes from your favorite Kosher restaurants? Get your copy of Secret Restaurant Recipes and discover the secrets of the world’s best kosher chefs. Be the first to own this magnificent new cookbook – enter to win a pre-release copy! To enter, comment on this post with your favorite restaurant dish. Click here to order Secret Restaurant Recipes. Click here for a sample recipe. Click here for all books by Leah Schapira and Victoria Dwek. **Giveaway ends on Wednesday, November 5th at 11:59 pm eastern time. Prize can be shipped within the USA. Winner will be notified via email and will have 48 hours to respond. Valid email address must be provided to claim prize. Limit one entry per person.